Categories (male / female, junior / senior) will be adjusted depending on the number of participants. - 1 sword Gumbup: Ssang Su Gumbup 1 to 12 for category KEUP, Yedo Gumbup 1 to 9 for category DAN. - 2 swords Gumbup: Ssang Gumbup 1 to 12 for categories KEUP and DAN. The participants have to salute the judges, announce the name of their Gumbup, execute their Gumbup and exit by saluting the judges. The competition is organized as 1 against 1 matches. The winner is the one who obtains the majority of flags. Matches are organized in pool phases. Depending on the number of participants, a knockout phase will follow to decide between the winners of each pool. For the final round, the participants should perform same gumbups (decided by the judges). Participants have to extinguish a defined number of candles with a Mok Kum (wooden sword) using the vertical cut Tchon Myon Begui. In case the sword touches the floor or the candle, the participant is eliminated. The competition is organized as 1 against 1 matches in a knockout phase. The two participants make an attempt each time the judges give them the order. The number of attempt is not limited: there will be as many attempts as necessary until one participant extinguishes the candle or is eliminated by touching the floor or the candle. The winner is the first one to extinguish the candle or the one who was not eliminated. If the two participants both extinguish the candle or get eliminated in the same attempt, additional attempts will be granted following the same rules until one participant is declared the winner. Round, three candles simultaneously during the third round ,etc. 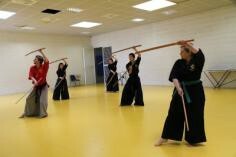 - KEUP: vertical cut Tchon Myon Begui in horseman position Kima Sae with a wooden sword. 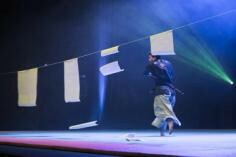 - DAN: horizontal cut Wen Dan Begui in horseman position Kima Sae with a real sword. The sword needs to be handled with two hands. The competition is organized as 1 against 1 matches in a knockout phase with one attempt only. The winner is the one who cuts the closest to the optimal cut, pictured by a line. 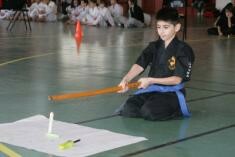 If the paper sheet is not completely cut, if the sword touches the floor or if the sword is handled with one hand only (DAN category), the participant is eliminated. If the two participants get the same score or get eliminated, an additional attempt will be granted following the same rules to decide between them. Preparation A player participating in sparring must be familiar with all the rules stated here for safety. The player must wear a helmet provided by the organizers during sparring. 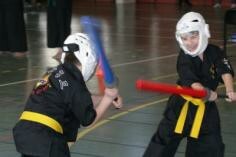 Only padded swords provided by the organizers may be used during sparring. Players will be allocated either red or blue colors. Points and winning: The entire body is considered proper target area, except hands from fingers to wrists and feet from ankles to toes. Also the groin area and eyes are forbidden to hit. A player may only touch the other competitor with the padded part of the sword. To score a point, the hit must be clear and made with the upper half of the sword. Light hits are considered “just a flesh wound” and give no points. Every accepted hit is worth 1 point. Hit to the helmet gives one extra point, totaling 2 points. Simultaneous or nearly simultaneous hits (retaliation within half a second) provide no points for either player. After any hit occurs, the referee will separate the players after allowing for “advantage” in combination. Combination strikes can result in a maximum of 4 points if the strikes are delivered without a scoring retaliating strike. Eg. 4 body shots or two body shots and one to the helmet. One center Judge and 3 “corner” judges will preside over the match. The lay out of the judges is one on each edge of the ring with red and blue flags to indicate a point scored. Two out of three corner judges must agree to score the point. The center referee will consult with the corner judges in regards to combination points and report to the official table and will likewise advise the official table of the points allocated for each strike given by corner judges I.e. Body or head shot, one or two points. The fourth edge of the ring will hold the officials to record points and time. Time will be paused at each confirmed strike until the score is recorded by the officials. The round lasts for 2 minutes. After 2 minutes the referee ends the match by saying “kuman” and the players must stop and return behind their starting lines. The player with the most points is the winner. If after the two minutes both players have the same amount of points, the match will resume until the other player gains the winning point (i.e. “sudden death”). Warnings and point reductions: All warnings are given by the field referee and recorded by the scoring officials. Stepping outside the competition area results in a warning. A competitor can get a warning from using a forbidden technique, swearing or other kinds of misbehavior. Every warning counts as half a minus point. Only full points are reduced from the final score. Three full minus points result in disqualification, i.e. instant loss. A serious offense results in a full point being reduced from the score or instant disqualification. The field referee handles all point reductions individually, but possible disqualifications are suggested by the field referee and confirmed or overruled by the whole referee panel after brief conference. A competitor may also be disqualified for being late from the start of the match for more than two (2) minutes. Competition area: The competition area is 8 m * 8 m wide and its borders are marked by tape. The starting lines for the competitors are located in the middle of the area, 3 meters apart. The competitor must face the opponent and start from behind his starting line after the referee announces the competition as begun by saying ‘sizak’. Referee panel: There are four referees for every competition: one field referee and three “corner” referees. The referees are the highest authority on scoring the match and their judgments are final and shall not be questioned on the spot. If a competitor or his team feel that a referee erred monumentally in his judgment of the match, they can lodge a complaint with the main referee of the tournament after the match but no later than 15 minutes after the misjudged competition. The complaint must be delivered in written form and signed by the competitor and one other team member, if present. A complaint fee of 10 EUR shall be paid immediately and will be returned, if the judges find in your favour. The participants, in pairs or team, present a fight they have created and choreographed. The performance should not exceed 1 min 30 and can be realized with or without music. 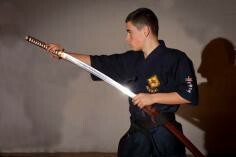 There is no constraint on the techniques: one sword, two swords, techniques of other martial arts (punch, kick, etc. ), acrobatics, etc., can be used. Scoring will depend on the quality and the originality of the performance. IMPORTANT !!! There will be no refund in case of cancellation Payment need to be done by wire transfer ONLY before March 29th. If the payment is not done by March 29th, the registration will be cancelled. Payment need to be done before March 29th 2015. The championships will be held in the gymnasium “Ubileynii”. Access: We will arrange the bus for all participants. Training sessions will be held in the gymnasium of the hotel “Smena”. No matter in what airport you will come – we will provide a bus in the Moscow for all of you to be transferred to Smolensk (place and time will be additionally informed)!!!!! 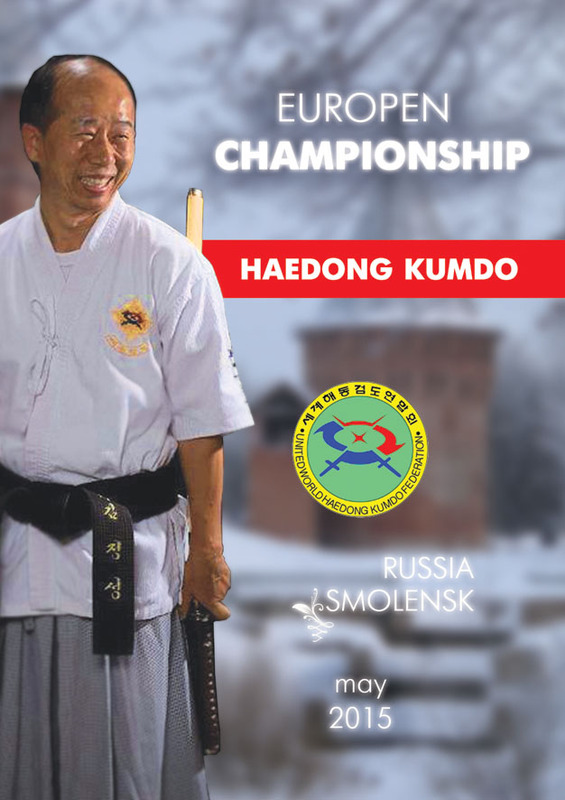 Russian Haedong Kumdo Association will provide transfer from Moscow to Smolensk (and back), accommodation in the Hotel “Smena” (from 1st till 5th of May 2015), 3 times a day meal for its own account ONLY for UWHK Members!!!!! The non UWHK participants must contact GM Kim Jeong Seong and Organizers for permission and accommodation details. No Real swords must be taken to Russia. It is forbidden by the local law. All swords will be given by the Organizers of the III EUCH. The Russian currency is Rubles. Mastercard and Visa are generally accepted in most restaurants, hotels and shops. Russia uses a 220 V electricity. European-style two-pin plugs are standard. No special vaccination is required when visiting Russia. In May, it is warm in Russia. Average temperature approaches 15°C, days are sunny generally.